Seeking to break a new methodological ground the book conjures up, in comparative perspective, the concept of equity in Sukra and Kautilya not so much on the basis of analysis of their respective major works; Sukraniti of the former and Arthasatra of the latter, but more so by examining their lives, the context in which they operated and the challenges that they faced. In this sense the present study is more extra-textual than textual. The reliance on extra-textual sources seems both appropriate and compelling because there is a near unanimity among the scholars that the extant Sukraniti text is not only corrupt but highly spurious. There is a similar controversy, though less acrimonious, about the authenticity of the Arthasastra text; even the authorship and dates of these works are contested. All these are issues, that scholars fully know, can never be settled satisfactorily. Therefore, rather than pursuing such false trails and thereby shying away from finding ways to discern the nature of their political concerns, the central focus of the present study is to examine their role as mentors and strategists in the major power struggles of their times; the stellar role of Sukra in the wars between the Aryans and the non-Aryans, particularly the one between Yayati and Varishparva at one time and between Visnu-Indra axis and Bali at the other; and the role of Kautilya in the intense no- holds- barred struggle for the throne of Magadha between the Nandas and the Mauryas and to cull out there-from their respective positions on critical issues like equity and social justice. The specific focus of this study is on the class character of these struggles, the positions that the two took, and the cause which each of them cherished, fought for and successfully accomplished. Dr. T.R. Sharma, till recently a Fellow at the Indian Institute of Advanced Study, Shimla retired as Professor of Political Science from the Panjab University, Chandigarh where he also worked for some years as the Honorary Coordinator of the Centre for Defence and Security Studies. Earlier, for nearly twenty five years he taught, among other places, at Government College, Bilaspur and Chamba and also at the Himachal Pradesh University, Shimla. In addition to a couple edited works, Dr. Sharma has authored two books; one on Indian Communism and the other on Marxist Theory. He has numerous articles in several reputed National and International Journals including, among others, Studies in Comparative Communism (California University), Modern Asian Studies (Cambridge University), Pacific Affairs (University of British Columbia), Australian Journal of Politics and History (University of Queensland), South Asian Horizon (Queens University, Kingston, Ontario ), Organisation and Work Values (Karl Marx University of Economic Sciences, Budapest) and Rule of Law and Organisation of State in Asia (institute of Federalism, Fribourg). In addition to being on the Editorial Boards/Editorial Advisory Boards of several journals including the Indian Journal of Political Science, Social Science Research Journal, Comparative Political Theory, International Review of History and Political Science, Diviner and Videshika (Foreign Affairs) he has also been the Editor of Studies in Humanities and Social Sciences for a few years. Besides being the founder member of the Executive Committee of International Society for the Study of Work Values (Israel), he has been member of several research groups like the Committee on Political Philosophy/Political Theory of the International Political Science Association (IPSA). Currently he is editing three books on different aspects of North East India including the Nature of Inter and Intra Tribal Conflicts, Reforming Education, and the Issues of Inclusive Development of the region. It has been very rightly said that choosing to work on ancient India is like choosing to plunge into a fathomless ocean. This is so because ancient Indian literature consisting of the four Vedas (Rig, Yajur, Sama and Atharva); four upa-Vedas (Dhanurveda, science of archery; Ayurveda, the science of medicine; Gandharva Veda, science of music and dance; and Sthapatyaveda, the science of architecture); six Vedangas (limbs of the Vedas) i.e. Vyakarana (grammar), Jyotish (astronomy), nirukt (etymology), Shiksa (pronunciation) Chanda (meter) and Kalpa, Alankar the twelve Brahmanas including Aitareya, Satapatha, Taittiriya, and Gopatha among others; the Aranyakas; nearly a dozen Upanishads including Chandogya, Kena, Prasna, Mundaka and Mandukyad Katha; the six schools of philosophy (Nyaya, Poorva Mimamsa, Vaisheshika, Sankhya, Yoga-Darshan and Uttara Mimamsa); four Kalpa Sutras (Shrauta, Grihya, Dharma and Sulbh); eighteen Puranas (Matsya, Markandeya, Bhagavata, Bhavishya, Brahma, Brahmanda, Brahmavaivarta, Vayu, Vishnu, Varaha, Vamana, Agni, Nardiya, Padma, Linga, Garuda, Kurma and Skanda and equal number of Upa-Puranas (sub or auxiliary Puranas); eighteen Smritis and the two epics (the Ramayana and the Mahabharata) constitute a plethora of literature which is so extensive, so diverse and so dense that it is beyond the capacity of a single human being to comprehend, analyse and interpret even a fragment of it. The contribution of very accomplished scholars who have spent their whole lives in trying to analyse and interpret it is no more than a mere grain of sand in a vast desert or a drop of water in an ocean. Then there are those who have remained engrossed only in tangential issues, who have not analyzed or interpreted any ancient Indian text or even a part of it; but have rather engaged themselves in futile debates. For instance, there is a lot of controversy as to who were the Aryans and where did they come from? One view is that the Aryans came from central Asia via the north-west India and captured Madhyadesa (central India) and Brahmvarta (the Indo- Gangetic plain stretching to eastern India). In the process of this expansion they pushed the original inhabitants of these regions to the south of Vindhyas or to north-east India or drove them into forests. There is also a view that the Aryans and the non-Aryans signify two different racial groups, one which came from Syria and the other from central Asia. The latter followed the former. They came in waves and those who came later drove away those who had come earlier. In the present study, we have taken the view that the Aryans and the non-Aryans belonged to different racial stocks and the latter were the original inhabitants of the land who resisted the Aryans expansionist agenda. The problem, however, does not end here. There are endless debates among scholars about the authenticity of a text or the exact date of its creation or its real author, questions, which they fully know cannot ever be satisfactorily settled because of the historical distance involved and because of the total absence of any reliable evidence, literary, archeological or any other. They are like those who go to the ocean but instead of taking a plunge continue to sit on the shores trying to count the waves, little realizing the futility of their whole exercise. Of course, they do tend to dampen the efforts of those who are seriously interested in understanding the ancient texts. Having chosen to work on a couple of ancient Indian texts it was difficult for me to decide whether to take a plunge or count the waves. There were problems in choosing either of these two courses. While joining the debate about the authenticity of the texts or about the dates of their creation seemed to me to be a mere wild-goose-chase; choosing to study a thinker of the past by analyzing his text, which the established historians and indologists considered spurious, seemed academically unsound if not worthless. Caught in this dilemma I thought it appropriate to charter a new course and make an attempt, howsoever modest, to understand a thinker by interpreting some of the events and activities with which he is, by tradition, associated, and where such association is not seriously doubted or contested and thereby to intuitively capture the essence of his ideas. The reader will find that in an effort to do so there is some degree of repetition in this work, particularly about the whole argument highlighting the inadequacy of the textual approach in an area like the one which I confronted and hence the need to rely on extra-textual literary sources. The present study is somewhat unconventional both with regard to its methodology and its scope. It follows a methodology different from most of the current methodologies of interpreting the ideas of political thinkers of the past, particularly those belonging to remote antiquity. In a modest way it attempts to put forth a new genre of research by conjuring up the science of politics of ancient seer and sage Sukracharya (hereafter Sukra) and the great strategist Kautilya, specially the power, not se much on the basis of study and analysis of the texts which are, by tradition, ascribed to them: The Sukraniti (or the Sukranitisara) of the former and the Arthasastra of the latter. Therefore, strictly speaking the approach in the present work is not textual. Further, the present study does not rely wholly on the context in which Sukra and Kautilya lived mainly because the context is not fully known. Thus, the approach is not even contextual in the usual sense of the term. The main consideration for not taking recourse to the textual approach is that the very authenticity of the extant Sukmniti as the work of Sukra has been and continues to be a subject of intense debate. In fact, most of the indologists and historians, both Indian and foreign, have declared the extant text to be partially or wholly spurious. Not only that, even the date of its compilation in the present form is fiercely disputed. So much so that the probable date ranges widely between the early centuries of the Christian era and nineteenth century AD. So for information on major events one can safely rely on Puranic accounts. In addition to the Puranic and Upa- Puranic sources one can also turn to the Vedas, the Smritis, the nitis and the epics. As far as Sukra is concerned there are references to him (either by his popular name or by his other names) in the Rigveda. In addition to the scriptural sources one can also turn to romantic and folk literature of antiquity like Hitopadesa, Pancatantra, Kadambari, Budhacharita, Kamasutra, Kathasaritasagara, Mudraraksasa, Dashkumarcharita etc. to supplement and crosscheck the facts about life and mission of Sukra and Kautilya. Although the account of events given in these sources may not always match fully and may be deficient in many respects, yet one can easily discern some common thread in the narratives which would be sufficient to provide a peep into the contours of their politics. While surfing these diverse sources and going through the various legends contained in them one is bound to realize that there is a better reflection of their politics in their political manoeuvres and in the way they carried out the respective missions that they had taken upon themselves than in the textual analysis of the works which bear their name. So for want of a better term one may say that the approach in the present study is somewhat akin to hermeneutical-interpretative. At least partly, if not wholly, the approach is extra-textual. 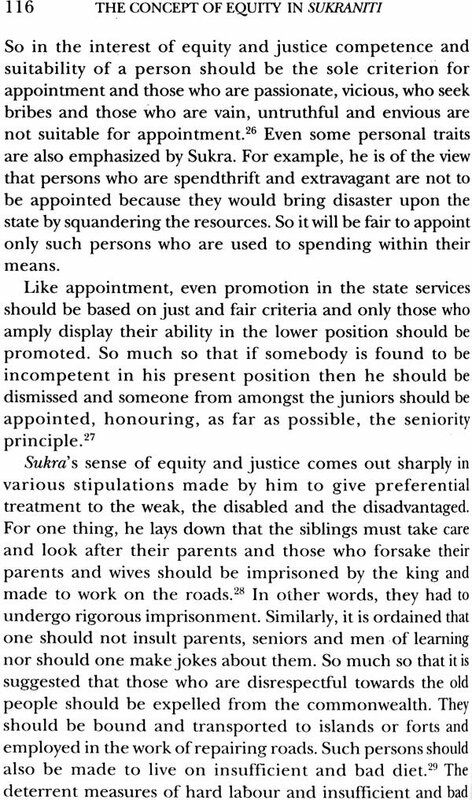 To the present author this extra-textual approach seems quite appropriate for understanding and analyzing not only the broad contours of politics of Sukra and Kautilya but also for comprehending their respective conceptualizations of equity. In fact, such extra-textual hermeneutical-interpretative approach is necessary and probably unavoidable because of the suspect nature of Sukraniti text and the total paucity of archaeological or other irrefutable evidence to which one may turn in order to understand his science of politics. In fact, the events with which Sukra was associated speak volumes for his commitment to justice and equity. In other words, despite all doubts and disputations about the date and authenticity of the Sukraniti text, there is no controversy about the stellar role that Sukra played in his capacity as the preceptor of some powerful non-Aryan kings in the course of their intermittent wars with the expansionist Aryans. Same is true about the role that Kautilya played in the overthrow of the Nanda dynasty from the throne of Magadha and in the installation of Chandragupta Maurya in its place either the orientalists nor the historians have contested the veracity of these events and the part played by Sukra and Kautilya in them.